Celebrity stylist Chaz Dean professes a passion for ensuring his clients have healthy, beautiful hair. Over the course of his years working in the beauty industry, he developed the opinion that most commercially-available shampoo was counterproductive to this goal, and as a result, has not used it on either himself or clients in over 14 years. However, this doesn't mean that Chaz prefers dirty hair. He claims that there is a gentler way to achieve silky, clean tresses using oils, conditioning agents and nonionic surfactants to dissolve and gently remove oils and dirt from the scalp and hair. Using skills honed in a previous product development project, he designed a system of cleansing that his marketing material proclaims to be a "revolutionary new concept." 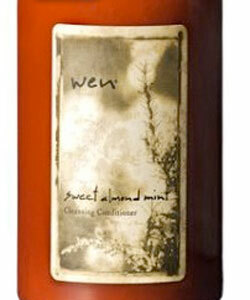 The result is the highly successful WEN hair care product line, founded upon the concept of a sulfate-free, non-foaming, cleansing and moisturizing conditioner. This is certainly not a novel concept for those familiar with the "Curly Girl" or no-shampoo methods. Many have been doing this for years with all sorts of products designed specifically to be conditioners rather than cleansers. There are also products by companies such as DevaCurl and Jessicurl that market cleansers that are either no or low-shampoo. What is fairly unique about the WEN products, however, is the sheer amount of mass marketing and mainstream publicity Chaz Dean has been able to garner, particularly through his use of QVC as a publicity and sales tool. The WEN products are fairly pricey and come with pretty specific instruction for use. In these formulas, nonionic surfactants work together with conditioning agents to help dissolve and remove sebum, product residue and environmental contaminants from the hair. Dean recommends that a fairly large quantity of the product be applied at the roots and worked down into the hair. The number of squirts he says to use varies with hair length. Once the hair is saturated, he prescribes a dash of water be added followed by gentle hand washing. For maximum cleansing and moisturizing, he then says the product should remain on the hair for the duration of the shower prior to rinsing. Users are then instructed to apply a final dollop to wet, rinsed hair from the midpoint to the ends for additional conditioning, shine and protection. So how do Dean’s cleansers stack up against other shampoos, low-poos and no-poos? An examination of the ingredients should reveal a significant amount of information. There are several main categories of ingredients in his cleansing products: emollients and conditioning agents, emulsifiers, humectants, botanical extracts and other additives. An emollient or conditioning agent forms a protective film over the surface of hair or skin, which adds gloss and shine to the hair, protects the hair from water loss to the environment (occlusion), and helps adjacent strands slide easily against one another. This all helps to reduce combing forces, facilitates detangling and prevents damage incurred by snarls. Conditioning agents can sometimes also act as humectants, attracting water to the hair. Some examples of familiar conditioning agents include dimethicone, polyquaternium-10, dimethicone copolyol, amodimethicone, shea butter, jojoba oil, fatty alcohols, many proteins, hydrolyzed proteins, coconut oil, mineral oil, petrolatum, small molecule cationic surfactants and alkyl esters. Below is a specific list of emollients found in the WEN cleaning products. Cetyl alcohol and cetearyl alcohol are fatty alcohols used as emollients that can help smooth the cuticle of the hair. They also function as viscosity modifiers, opacifiers and emulsion stabilizers. Plant-derived oils such as shea butter, jojoba oil, coconut oil, sweet almond oil and avocado oil are highly effective and nourishing emollients. Amodimethicone is an amine-functionalized silicone polymer that aids in color retention, smoothes, conditions and adds high gloss to the hair. This particular silicone polymer, while water insoluble, has been found to resist accumulation via build up on the hair surface, even with repeated use. Stearamidopropyl dimethylamine is a tertiary amine surfactant used as a film former that can smooth the cuticle and reduce friction and combing forces. PEG-60 almond glycerides is a useful emulsifying ingredient that possesses mild conditioning properties. Guar hydroxypropyltrimonium chloride is a cationic polymer that provides excellent moisturization and conditioning properties via adsorption onto the surface of the hair. Dicetyldimonium chloride is a small molecule cationic surfactant that provides mild conditioning to hair via adsorption. Hydrolyzed wheat protein can provide protection and conditioning to hair via film formation at the surface and also via penetration into the cortex of the hair. People with certain hair types enjoy the results of this better than others. Emulsifying agents (also known as surfactants) are materials, which have amphiphilic character, meaning they are both water-loving (hydrophilic) and oil-loving (lipophilic). This special property enables them to be used to create and stabilize oil-in-water and water-in-oil mixtures known as emulsions. The WEN formulas rely upon nonionic surfactants for this job, and they are effective at dispersing the non-water soluble materials in his products. Ceteareth-20: This is a mixture of ethoxylated fatty acids (cetyl- and stearyl-) that is a nonionic surfactant typically used as an emulsion stabilizer. Polysorbate 60 is an ethoxylated sorbitan derivative that is a nonionic surfactant used as an emulsifier. Humectants are materials that contain water-attracting elements, typically oxygen in hydroxyl and carbonyl groups. Some of these liquids can also act as solvents for some materials that are less soluble in water. Glycerin is a moisturizing humectant that also imparts a thick, velvety texture to a product. Panthenol is a pro-vitamin that is a highly effective humectant. Butylene glycol is a humectant and also a co-solvent. The remainder of the ingredients is a mixture of botanical extracts that adds little to the function of the product, fragrance, mild acids or bases for pH adjustment and preservatives. The mainstream cosmetics and hair care industry is still mystified by the aversion many are developing to the use of synthetic surfactant-heavy shampoos. However, the success of products such as these might send a message to the larger companies that there is a large sector of the market that desires something different for their hair. The main criticism of these products from a formulator’s perspective is that the ingredients list does not seem to adhere to INCI labeling standards for hair and skin care products. This makes it difficult at first glance to determine the approximate proportion of each ingredient listed. It is important if one desires credibility in this industry to strive to maintain labels that are clear and follow standard protocol. Overall, Chaz Dean’s conditioning cleansers look to be capable of providing the same level of cleansing as many other conditioners and no-poo products designed for the same purpose. The inclusion of amodimethicone, guar hydroxypropylytrimonium chloride, fatty alcohols and small molecule cationic surfactants indicates that the product should impart a significant amount of conditioning properties to the hair as well, so it should be able to replace the need for multiple products. The quality of the ingredients seems to be superior to most very inexpensive drug-store conditioners often relied upon for conditioner washing. However, whether WEN cleansing conditioners provide as much benefit as one would hope when considering the price remains to be seen by this curly chemist. What has your own experience been?